Christmas eve was always hosted in my house since the time I was born. Family getting together was not the only part of my excitement this day. It was not only about the presents either. As a kid, it was not only about getting permission to sleep at 2am as well, (after playing with my new karaoke Singstar playstation CD). As an even younger kid, it was not about getting scared by Santa Claus either, (yes haha! I actually once ran away and hid in the toilet when my grandpa, disguised in the silly big fat man, knocked on our door. I was about 5 years old) or driving my Barbie in her new plastic pink “Ferrari”. It was not about getting surprised again when opening up the presents, (because we already knew exactly what we had asked for Christmas). Of course, it was about all these memories. Back home from a party late at night, passing by the living room on my way to my bedroom, I discovered, agape, the funeral of the grandiose Christmas tree my mom has ditched for 14 small trees, standing naked of any lights and Christmas decoration and filling up the vast empty space. Her Christmas ambition was a forest and not just a tree. My mom cooked dinner herself for the entire family with the help of her elves every Christmas eve. 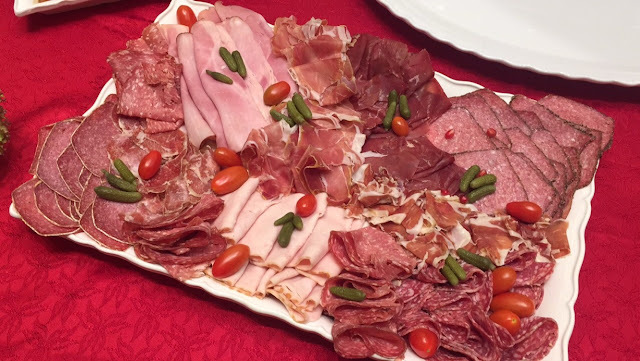 When I was younger, my mom would let me take charge of the appetizers as I took pride in contributing to her perfectly conceived and tasteful menu. As I grew up, along with my siblings, my brother, almost 18, started to take last-minute cues from the supermarket and my sister specialized in cooking the turkey with mom. Later in the early evening, the rest of the family, the tetas and the aunts would come a bit earlier to help finish up the last details. Then, an inter-generational girls talk involving the grannie and the 7 year old cousin who sneaked in the kitchen to grab a glass of water, would kick out any men who entered the kitchen. With time, I have come to cherish and appreciate those precious moments. As for my mom's exclusive Christmas dinner menu, there was two salads as usual, a cheese platter and a charcuterie platter, some foie gras biensure, caviar toasts, salmon verrine cups, and a Buche de Noel cake that no one is ever able to eat following the big turkey main dish. 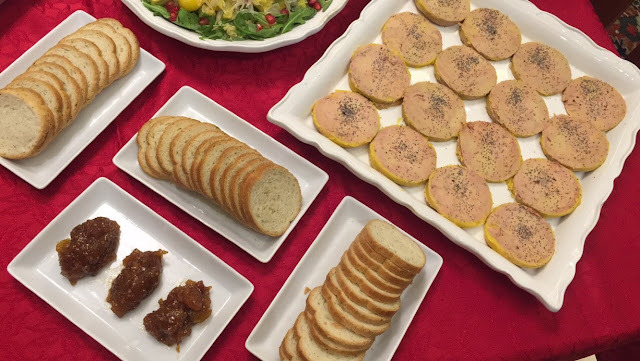 Foie Gras with fig jam and some brioche bun slices. 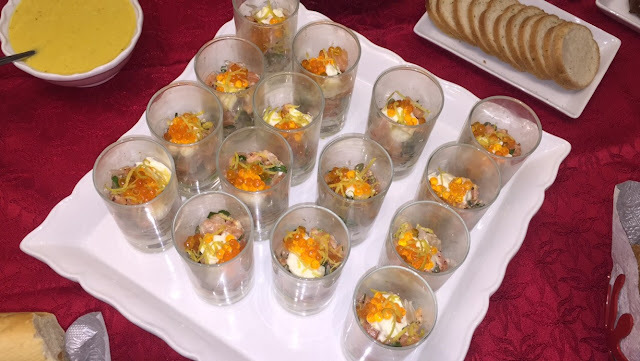 Raw salmon verrine cups with cream, avocado and salmon eggs. 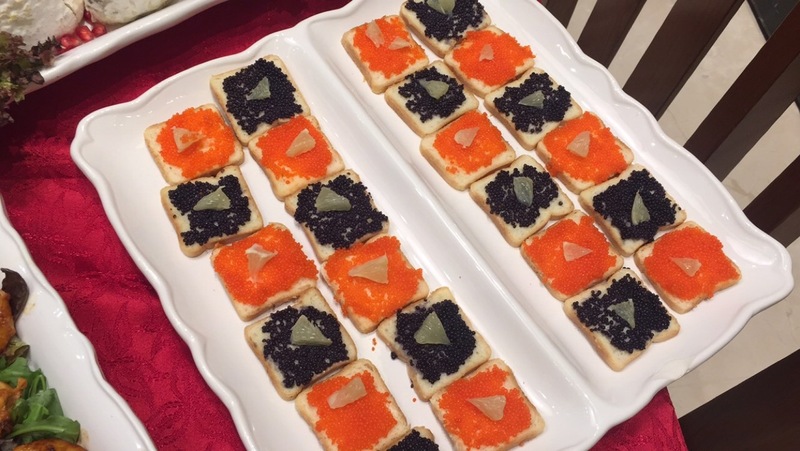 Mini buttered toasts topped with caviar and lime. 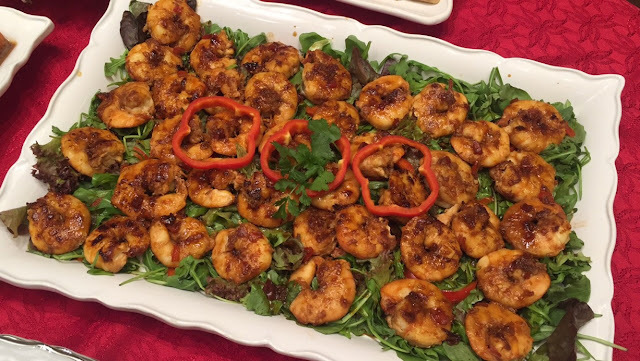 Fresh Gambas marinated in honey, wine, ginger, garlic, onions, and pepperbell. 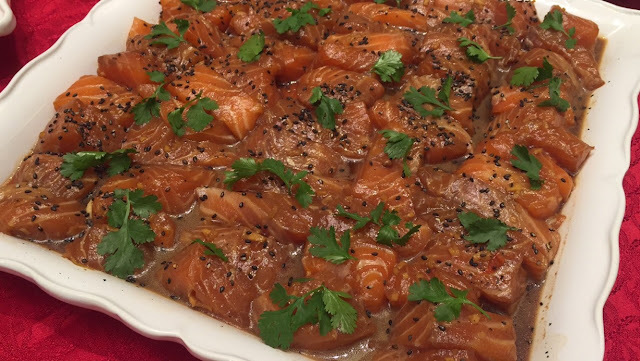 Fresh Salmon marinated in Soy Sauce, honey, garlic and ginger. 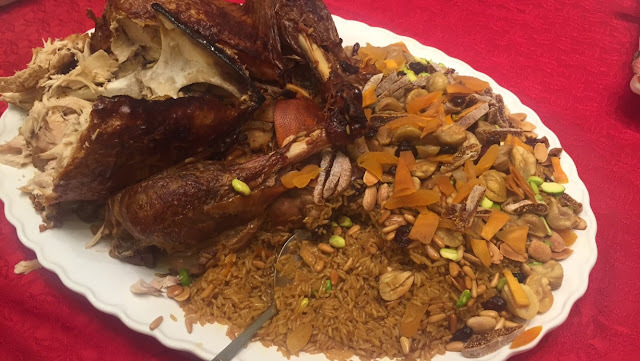 Turkey with a honey orange and ginger sauce.